On 31 March, 1882, Eduard Hammenstede of Cologne, Germany, received German patent No. 20443 on Schnell-Addirmaschine (Quick Adding Machine). 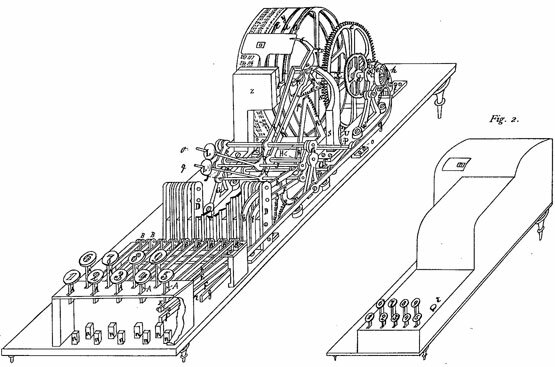 The device was a column adder with a large numeral drum and keys, arranged in two rows and as whole looks very much alike the earlier calculating machine of Thomas Hill. The machine of Hammenstede looks like it has a simple and reliable construction, but it never went in production and remained only on paper. Carl Eduard Hammenstede was a German watchmaker, born in 1845 in Düsseldorf, Preußen, in the family of Heinrich Hammenstede and Anna Christiana Klein. In 1868 he immigrated to Belgium, where he lived for several years, then returned to Germany and settled in Cologne.